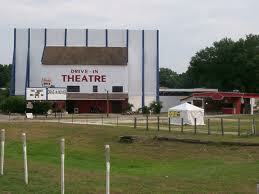 Please enjoy our list of the drive in movie theaters in Florida. 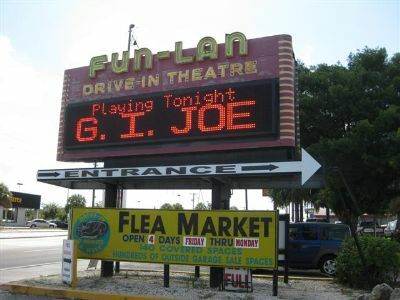 The Fun Lan Drive In Theatre provides a four screens worth of first-run feature films every evening, and is tied to the Fun Lan Swap Shop, which is one of the largest in the area. 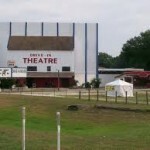 Unlike many theaters, it has actually been expanding, increasing to four screens in 2006. 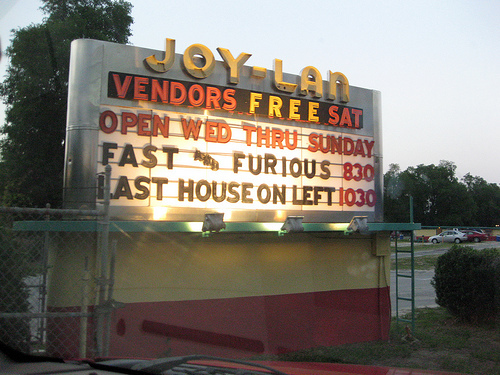 The Joy-Lan Drive-In nearly closed in the mid-1990s, but along with the Silver Moon Drive In, was saved by drive-in enthusiast, Harold Spears, who made it back into a successful drive in. They show a single double feature each night from Wednesday to Sunday. The theater also doubles as a market during the day. 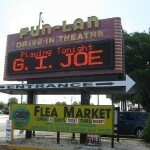 Founded in 1968, the Lake Worth Drive in has two screens, each of which shows a separate double feature every night. The theater is very popular, so you should get there early to get a good spot. The also function as a swap shop during the day. 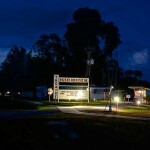 The Ocala Drive-In and Flea Market is owned and operated by the Watzke brothers, who come from a family that has own and run several theaters. The theater itself shows a single double-feature every night. For the children, then have a Bouce House that they can plan in before the film and during the intermission. 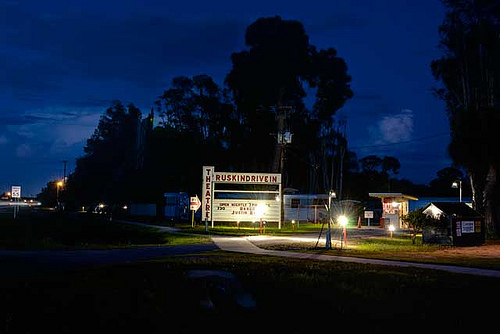 The Ruskin Family Drive-In Theatre provides family entertainment year round. They have a single screen, and show a double feature every night of the week. Though they do show “R”-rated films, they focus more heavily on films for the whole family. 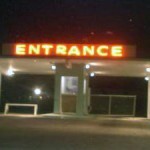 No alcohol is allowed in the drive-in. 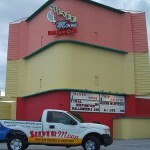 Their food is of high enough quality that the theatre serves as a take-out food restaurant. 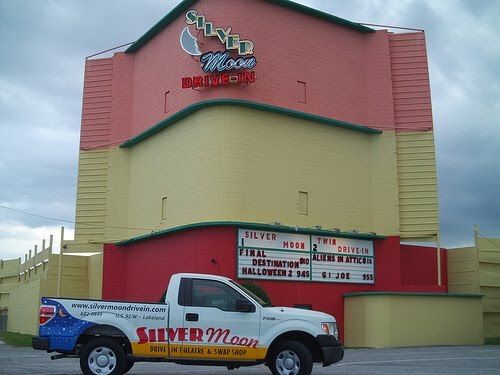 The 63-year-old Silver Moon Drive In Theatre has a rich history. 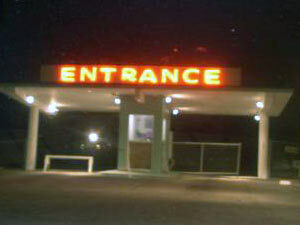 It survived until 1996, when, like many drive-ins, it was almost shut down. 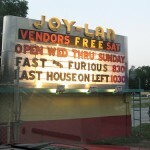 Instead, Harold Spears, a drive-in enthusiast, saved the theater by starting Sun South Theaters, the same company that now owns the Joy Lan Drive In. The theater has a two-sided screen, showing two double-features per night. That have a full concession stand that serves alcohol. It also serves as a market during the day. 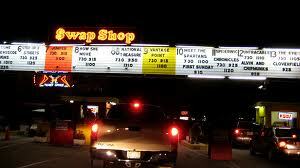 The Swap Shop Drive In has a whopping fourteen different movie screens, each showing double features every night (though not fourteen different double features, as there is some repetition). Curiously, the theater doesn’t have its own name, but is simply tied to the giant swap shop in Fort Lauderdale. As you can probably guess from the number of theaters, the Swap Shop is massive, and is a tourist attraction in its own right.